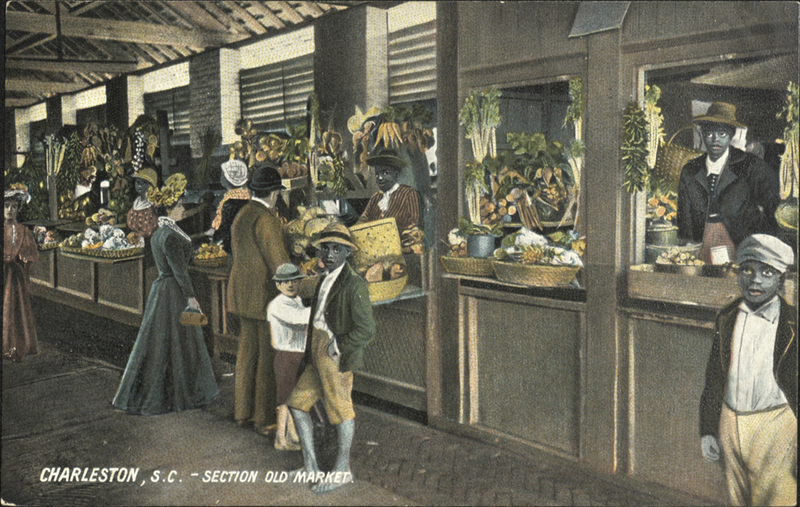 "Section Old Market," postcard, Charleston, South Carolina, ca. 1800s, courtesy of the South Carolina Historical Society. During his apprenticeship, Nat Fuller and Eliza Lee would have walked to the public market regularly to gather provisions for her kitchen. As an apprentice, Fuller was responsible for hauling back the day’s purchases, perhaps stopping by one of the groceries for flour, salt, sugar, and spices. Culinary apprenticeships were organized in a distinct way in the early nineteenth century, particularly those that entailed baking and patisserie. In antebellum Charleston, skilled enslaved apprentices often worked away from their owner’s residence, and their tasks were labor intensive. Nat Fuller probably began his tutelage under Eliza Seymour Lee in 1827 by hauling wood to the brick ovens of her shop and building fires well before sunrise. He would also chop vegetables for soup (served to the public at 11:00 a.m.), while Eliza Lee and her senior apprentices baked bread loaves. In the early morning, he would walk six blocks with Eliza Lee to the public market, which opened with the tolling of a bell at sunrise. Once they were done shopping, he would haul back the day’s purchases, and perhaps stop by one of the groceries for flour, salt, sugar, and spices. His morning would then be entirely absorbed in prep work and cleaning. Eliza Lee did not serve breakfast. Lunch did not become an established meal in Charleston until the 1850s. Dinner—set on the table at 3:00 for Lee’s boarders—was the primary meal of the day. Guests arrayed themselves around long tables and had dishes served to them from platters. Under Eliza’s tutelage, Fuller learned how to wait tables as well as cook. After the dinner cleanup, Fuller most likely returned to Gatewood’s house. "The Leamington Stove, or Kitchener," drawing from Beeton's Book of Household Management, edited by Isabella Beeton, 1861, courtesy of the Wellcome Library. 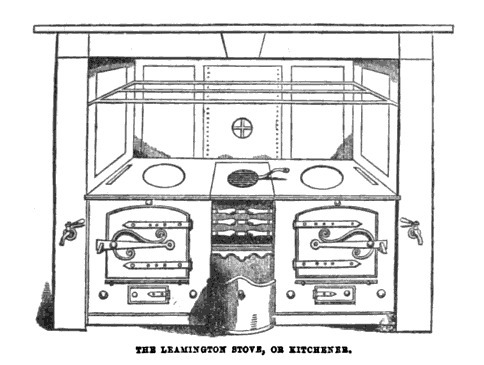 Toward the latter half of the nineteenth century, the larger hearths of older kitchens were replaced by elaborate metal stoves like the one above. During his second year as an apprentice, Fuller would have learned the rudiments of making dough. Meat cooking, the preparation of sauces and savory pie fillings, and the mastery of side dishes occupied his third year working under Eliza Lee. His fourth year was devoted to learning about more intricate dishes, as well as cakes and pastry making. Additionally, fourth year apprentices were often regarded as “journeyman cooks” who could be trusted to assist accomplished caterers, like Eliza Lee, in the preparation of on-site banquets at public buildings and in private meeting halls. During the period of Fuller’s culinary apprenticeship—the late 1820s to the early 1830s—two revolutions took place in professional kitchens: the stove supplanted the hearth as the engine of cookery, and chemical leavens enabled cooks to make quick breads and biscuits without waiting for yeast to interact with gluten to make the dough rise. As a result, Eliza Lee practiced a substantially different art than that learned by her mother Sally Seymour. In addition, during this time the supply of ice from New England, and the capabilities of ice warehousing facilities in Charleston, grew to the point that cold confections could become featured items on the tables of elite balls and receptions—including ice cream, sherbets, and flavored ices. 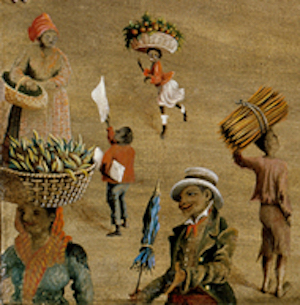 Detail from "Charleston Square," painting by Charles J. Hamilton, Charleston, South Carolina, 1872, courtesy of the Abby Aldrich Rockefeller Folk Art Museum, The Colonial Williamsburg Foundation, Museum Purchase. This detail focuses on the ice warehouse, which is visible behind the market stalls. Beginning in the 1820s, ice imports from New England grew in Charleston, and could be kept in these newly designed facilities. Once Fuller finished his apprenticeship in the 1830s, his relationship with his instructor did not cease. His culinary talents—in game butchery, the boning of fowl, and the composition of entrées—were all needed in large-scale banquets. As a free woman of color, Eliza Lee could acquire her own slaves and had access to a constant supply of enslaved apprentices from households in town, but these trainees did not always possess Fuller’s skills. Once he fully returned to Gatewood’s service as a trained cook, Eliza Lee still occasionally paid a fee for Fuller to assist her. In the process, Fuller apparently became close with another of Lee’s trainees, a pastry cook named Diana. They would marry in the late 1840s and have children throughout the 1850s.